Why wait weeks or months for results when you can enjoy beautiful, radiant skin in about a week! The many innovations that created the VIPeel combine to enable the entire continuum of skin types to enjoy the benefits of the peel. For the first time, darker skin types can experience high grade anti-aging and restorative skin care previously unavailable. With a single 3-4 minute application, 100% guaranteed results are dramatic in just seven days! 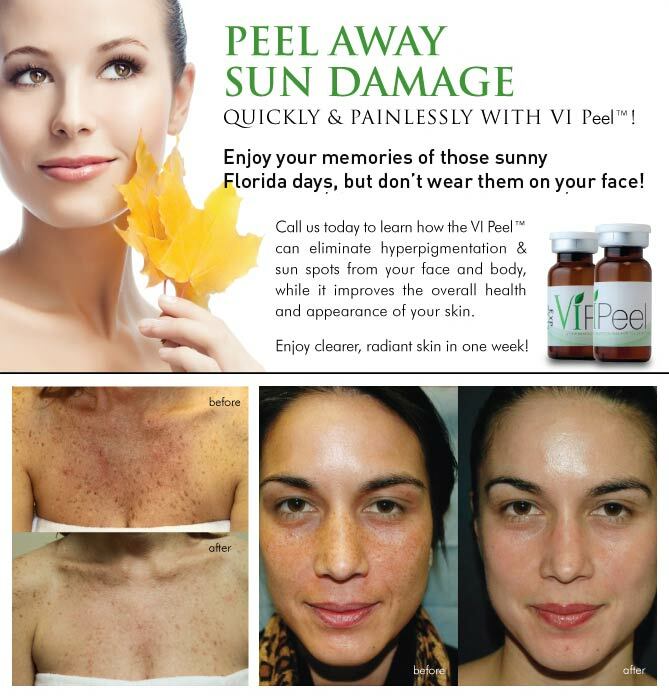 VI PEEL ACNE is the most effective Acne treatment available today! It contains our original peel formula plus these powerful ingredients for superior, consistent results for you and your patients: Benzoyl Peroxide removes bacteria, clears the pores & increases cell turnover Salicylic Acid: causes the cells of the epidermis to shed, opening clogged pores and neutralizing the bacteria within while constricting the pore diameter to prevent further clogging Vitamin C: A powerful antioxidant to remove toxins from the environment Kojic Acid: brightens skin and reduces acne scars. Vi Peel ACNE ingredients: TCA, Phenol, Salicylic Acid, Retinoic Acid, Vitamin C, and Proprietary Mineral Blend, PLUS the addition of Benzoyl Peroxide, Kojic Acid, and Hydrocortisone. All of these wonderful ingredients play an imperative role in clearing acne and blemishes, and providing a beautiful complexion! The Salicylic Acid inhibits sebaceous glands and causes the cells of the epidermis to shed, opening clogged pores and neutralizing the bacteria within while constricting the pore diameter to prevent further clogging. Benzoyl Peroxide is an antibacterial agent that travels to the root of the dermis to unclog pores, Vitamin C is a powerful antioxidant to prevent against DNA cell damage from UV light exposure, and Kojic Acid is a natural skin lightening agent that brightens skin and reduces acne scars.